Sanic is a Flask-like Python 3.5+ web server that’s written to go fast. Great! I used Flask at my previous job. To be clear, Sanic is not based on Flask, but it's API is Flask-like. Good enjoy to start with. With the framework set, and previous experience with a similar framework, I wanted to go through how Sanic works. 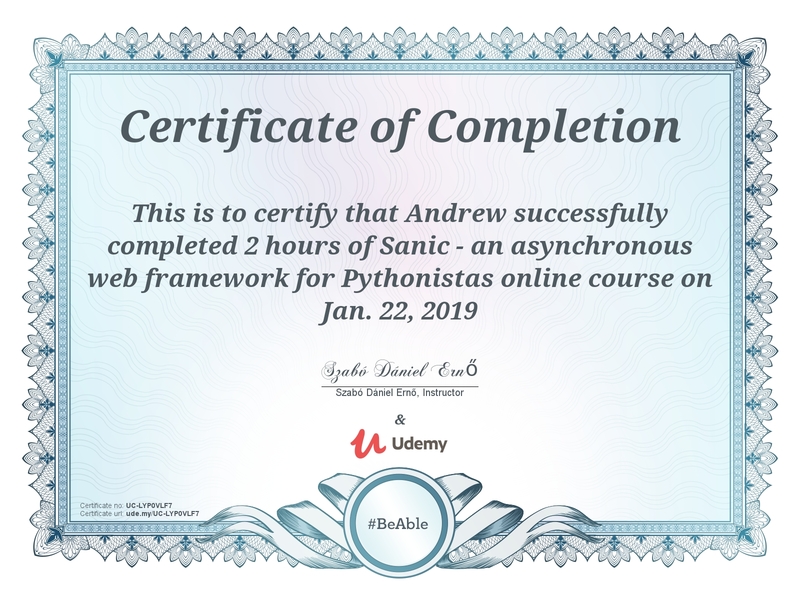 I turned to Udemy and the Sanic - an asynchronous web framework for Pythonistas course, created by Szabó Dániel Ernő. The course is roughly two hours long and consists of 20 tutorial videos. Each one is less than 10 minutes long. It covers a wide range of features available in Sanic. The instructor made their code available on GitHub. I never actually used the GitHub repository though. Instead, I followed along with the brief tutorials. For me, this speaks to the instructor's ability to keep the lessons and code short and simple yet effectively show how a single feature works. By making the code easy enough to type and follow along, the lesson was more effective because I was doing instead of just reading code. The lesson code will then go after the app variable is defined. The problem with this boiler plate code is that the instructor types it out every single lesson. Again, this is minor and it makes each lesson self contained, but I think having this code already written and adding in the important, lesson specific code, would have made the lesson more succinct. It also would have prevented a few typos that the instructor made and had to spend time correcting. Ironically, in the error handling lesson, the instructor had an error in their code. This is great, because it helps to see how to troubleshoot errors that Sanic can throw. My issue is that the instructor left the time where he's looking at another monitor (probably reading documentation) in the video. I feel this time could have been removed and the troubleshooting steps still been effectively shown. Overall, I was happy with this course. It's about two hours long and does a good job of showing various aspects of Sanic. I don't recall ever being pointed to the documentation, which is a little surprising, but it was easy enough to find. The course provides a good foundation of knowing what Sanic can handle. As of the time of this post, Udemy says there have been ten students that signed up for the course. That is low and the lack of Q&A is also a bit concerning. I don't know how responsive the instructor is to student questions. If you have a few hours (and dollars, during a Udemy sale) to spare and wish to learn some basics about Sanic, this is a good course to take. If not, the GitHub repository contains all of the lessons you go over.